"IBUKI": Global efforts to protect the environment. Global warming has become a very serious issue for human beings. Scientists have suggested that, at the rate the Earth’s temperature is rising, an extreme form of global climate change could occur in a few centuries. In 1997, the Kyoto Protocol was adopted at the Third Session of the Conference of the Parties to the United Nations Framework Convention on Climate Change (COP3), making it mandatory for developed nations to reduce carbon dioxide emissions by six to eight per cent of their total emissions in 1990, and to meet this goal sometime between 2008 and 2012. Furthermore, the Global Climate Observation System (GCOS) has been proposed by the World Meteorological Organization (WMO) and the United Nations Environment Program (UNEP) in order to strengthen observations of land, ocean, and space conducted by each country. The concentration of the greenhouse gases has been observed at observation sites on the ground and by aircrafts. However, there are only 348 sites (as of January 2013) and these sites place a disproportionate emphasis on a few areas. “IBUKI” is able to measure the concentration of greenhouse gases such as CO2 and CH4 over almost the entire surface of the earth at equal intervals every 3 days from the orbit traveling around the earth in approx. 100 minutes. This has made it possible to increase the observation points exponentially than before as well as obtaining the data over the region where we had no data until now. 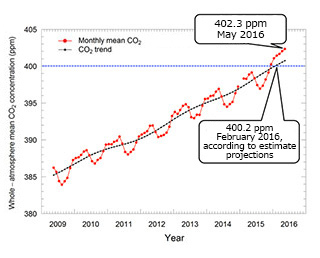 And it has been able to improve the estimation accuracy of the net flux of CO2 by up to 40% until now through the use of these data. The data obtained is anybody can use these data if they register as well as providing to governmental Institutions and scientists of various countries.